​For the past seven years, teams from Macon and other cities in Georgia, Tennessee, and North Carolina have gone to Brazil each summer to assist Uneidas Mission (The Indigenous Mission) ministering to the Indigenous peoples. Painting the Medical/Dental Clinic building inside and out. Painting designs on the inside of each office. Building the wall on the one side of the compound. Pastors conference in the village, about 3 ½ hour drive from Campo Canaã. ​Mário Ribamar, the Director of the Campo Canaã, gave us the following update for the Spring of 2017. This coming semester there will be indigenous peoples from 9 different tribes. Thirteen (13) are returning from this past year and they are expecting 20-25 new students, six (6) of these will be new couples. This new semester will begin February 20th and ends June 22nd. The safe arrival of the new students. Monthly financial partners for the Training Center (Campo Canaã). Each student is to pay $R300/month. This is equivalent to approximately $100/month. Due to the economic situation within Brazil, food and material prices have increased significantly. Because of this, there is a deficit per month of $R6,000 (equivalent to $2000 USD). i.Two years ago the electric bill was $R735, it is now $R1800 (equivalent to $600 USD). There have been a total of 31 graduates since the school began. Tthis was the 4th graduating class. The goal is for all of the graduates to return to their villages and to the villages beyond to reach others for the Lord. Currently about 90% of the graduates are working missionaries in their villages with small congregations. 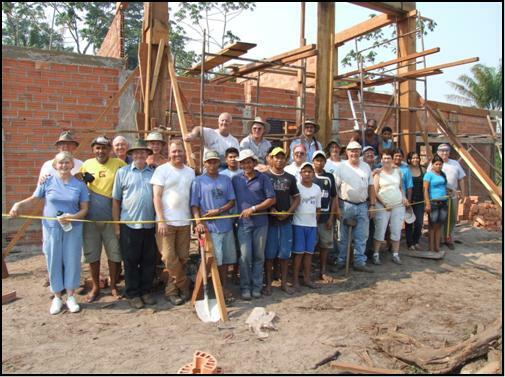 Pray a hedge of protection around them and their families, as Spiritism is strong in Brazil. Pray they will be faithful to the call that the Lord has on their lives, for safety, for provision, and for health. Mário Ribamar’s truck, used for personal as well as the ministry, needs to be replaced with a more reliable vehicle. Repairs are expensive and occurring frequently. Mário takes students to villages on the weekends for practical application of what they are learning. To replace this truck, the current quote for trade-in will cost $R28,000 for the purchase of a new one (Equivalent to approximately $10,000 USD). The financial support for the faculty, who receive their support from churches. The churches are notifying some of the faculty that they can no longer support them. The school cannot go on without the faculty. Pray diligently for provisions for these precious leaders. Pray for the Lord to create the teams that He needs to do the work required. Pray for health and safety in travels and finances for the trip. The opportunity is there for multiple teams to go throughout the year, not just summer. Pray for translators (Mark and Leslie Vance) going with the First Team to translate the many hours of teaching for the Pastors and Wives. Pray for the Brazil Mission Leadership, for wisdom and direction from the Lord. Pray for Onésimo and Marilda Arruda, for discernment for the direction the Lord has for them. 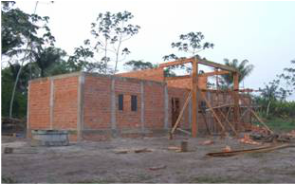 Pray for Mário and Tania Ribamar, the Director of Campo Canaã, for wisdom. For health, safety, and wisdom for the faculty and students. For the daily provisions for the entire center. For the center to continue to become self-sustaining. That each student will keep their focus on Jesus and desire with their whole hearts to go back to their villages to teach their people what they have learned about God and His Word. From there to reach other tribes who have not heard of Jesus. For yourself – what does the Lord have in this for YOU! Come join us – it is an opportunity of a lifetime to serve the Lord. What a privilege and honor it has been to be part of the Lord’s work. If you cannot join us, please pray! The men's dorm in progress. 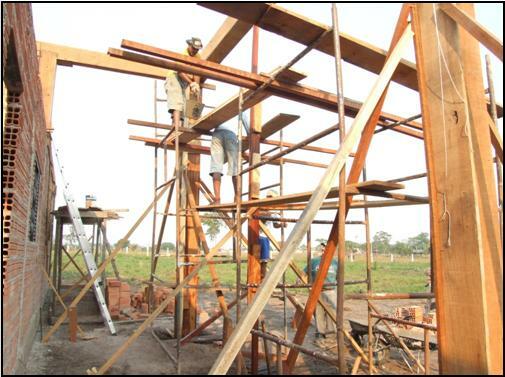 In 2010, a team of 13 began the construction ministry. The team took tools that were left to enable the Indians to continue the work. The tools would then also be available for the future teams. A men’s dorm to house 20 was partially constructed, leaving the Indians to complete the roof and inside work. There were 4 Indians from 3 different tribes staying at Mário’s home studying Portuguese at the local school. They were awaiting the 2 year course from Dallas Theological Seminary to be translated into Portuguese. This course was being translated so they and future Indians could learn strong Biblical principles and doctrines. ​At the Canaan Training Center, Campo Canaã in 2004, indigenous missionaries, Mário and Tania Ribamar (Tania, a Terêna Indian) began a work with the Tupari Indians of western Brazil. They moved to an abandoned German Mission base in Pimenta Bueno to begin the Canaan Training Center, Campo Canaã. The Lord gave Mário Ribamar the vision of reaching the lost tribes for the Lord. There are over 240 tribes in Brazil and approximately 180 tribes are unreached with the Gospel. Campo Canaã was established for the Indigenous (native Indians) of Brazil to come out of the tribes to this facility to live while they study God’s word. The objective of the school is to train them to return to their own tribes and then to reach the tribes beyond for the Lord. They needed dorms, a kitchen / dining hall, classrooms, married couples housing, day care center, a woodworking shop and more. The Lord provided the vision and direction for Mid-State Baptist Association to join this ministry and to be part of this endeavor to reach the lost tribes for Jesus. What an awesome humbling experience to be part of what the Lord is doing. This link below notes the status of the tribes being reached for Christ. Note the legend on the map included. Copy the link below in your browser as it will allow you to enlarge the picture to improve readability. RondoniaThe State of Rondonia, in Pimenta Bueno, is the location of Canaan Training Center. Teams have worked there since 2010, continuing through 2014. A team is returning 2016 to continue the work there. The two red tiled roofed buildings were the original buildings when Mario took over this property from the German Mission. Praise the Lord with us regarding what HE has allowed us to assist them in accomplishing, ALL for HIS GLORY!! 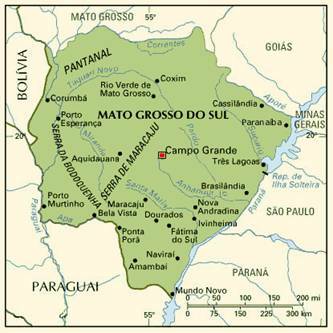 The State of Mato Grosso do Sul is where the team in 2015 served. Outside of Aquidauana is the small town of Anastácio. This is the location of the Institute Biblical Cadesh Barnéia (IBCB), founded by the South American Indian Mission years ago. This Institute was turned over to the Uniedas Mission, a national Indian Mission. The pastors are returning 2016 to conduct a conference for Pastors and their wives.